"Last one down the sand dune buys the beer tonight", Maarten challenged. I rolled my eyes to show that I had no interest in participating… and then I started running down in a full sprint. Not 20 minutes earlier, exhausted from our hike through the canyon, I barely had enough energy to wave off the flies from my face as we were eating lunch. We were in the red sand dunes of Wadi Rum where it was scorching hot and I was nearly out of water. My, how quickly the promise of beer changes a situation. 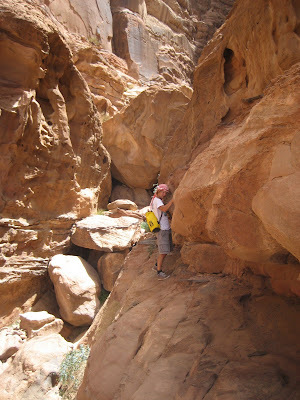 Before entering the canyon, we decided to play it safe and declined paying for a guide or a map. 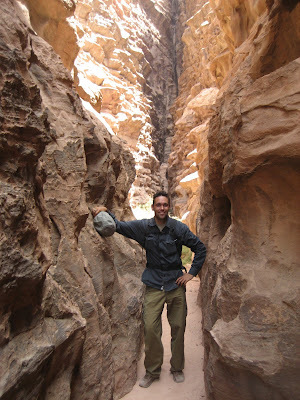 How hard could it be to navigate through a canyon that the Lonely Planet describes as 'labyrinth like'? My, how quickly I forget my past mistakes. It only took us one hour to realize that we had gone one hour down the wrong canyon. 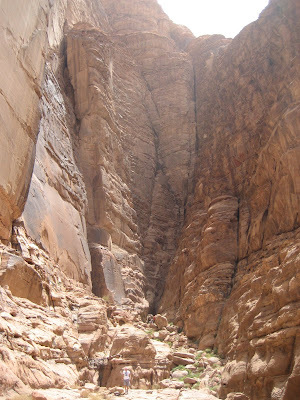 Finally after stumbling on a group of French climbers, we were shown the correct canyon wall to scramble up. It turned out to be some of the most beautiful and technical hiking I've ever experienced. Good scary fun. Now neck and neck, Maarten and I were running full steam down the side of the dune. There was no definite end to the dune; just a gradual run out. This was stupid. "Where is the end?" I choked. "This is stupid!" Maarten choked. "Call it a draw?" I choked. We bent over holding our legs and looked out at the 3 hours of desert that we still had to cross. A long, beautiful day. Ropes would have been nice. Paging Indiana Jones... please come to the white courtesy phone. Did you find the grail? So, did you climb that wall? Amazing.